1, switch 6 on/off button to divide the table into two States unipolar/bipolar two full scale input. SW6=ON, select the unipolar; SW6=OFF, select dual polarity. 2, switches 4 and 5 Select gain. SW4 and SW5 3 combinations, namely SW4=ON,SW5=OFF;SW4= OFF,SW5=ON;SW4= OFF,SW5=OFF. A case study of unipolar, when SW4=ON,SW5=OFF, full scale input 0 to 50mV,0 to 100mV when SW4=OFF,SW5=ON; full scale input 0 to 500mV,0 to 1V; if SW4= OFF,SW5=OFF, full scale input 0 to 5V,0 to 20mA,0 to 10V. 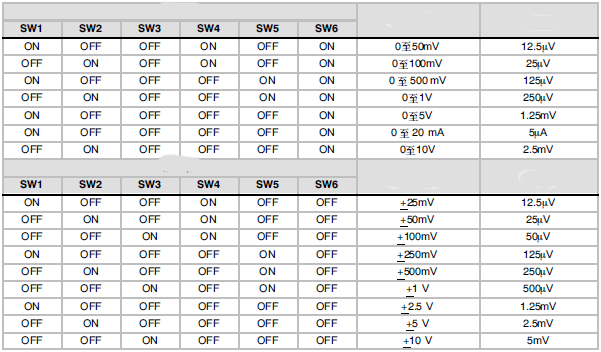 It is easy to see, SW4= OFF,SW5=OFF corresponding to a current or voltage DIP switch full range input is combined with the first two DIP switches correspond to the current or voltage full scale input into 100 times-times, 10 times. 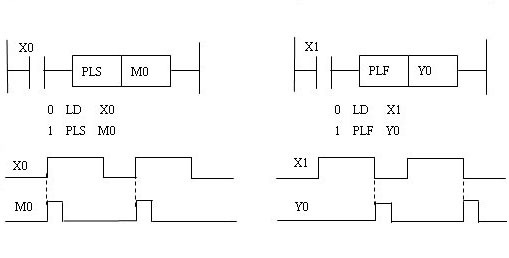 Switch 4 and 5 Select gain *100,*10,*1. This entry was posted in plc program and tagged plc basics, plc training, plc training courses on June 13, 2016 by arco. Note: when X0 is ON, the normally open contact closure, Y0 connected and self-preservation; when X0 is off, the timer start time delay when X0 when time reaches the time timer setting is removed, Y0 from ON to OFF, realize the loss of delay. 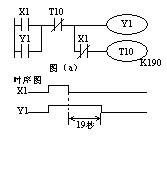 (4) attention to process analysis: X0 connect 1S,T0 ON,Y0–State output for the ON,T0 is ON the normally closed contact, T0,Y0 changed its status to OFF. When the X0 is ON, and after a scan cycle, repeat the previous state. This entry was posted in plc program and tagged plc programming examples, plc training, plc training courses on June 13, 2016 by arco. 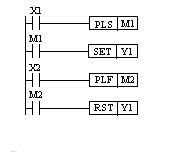 This entry was posted in plc program and tagged PLC ladder diagram, PLC programming, plc programming examples, plc programming tutorial, plc training on June 12, 2016 by arco. SET command called reset instructions. Its function is to: driving coil, making it with locking function, maintain the on State. In Figure 1, when the movable contact X0 closed, SET instruction is executed, Y0 coil connected. After first X0, Y0 coils to keep the on State to Y0 coil power, you must use the RST reset instructions. Reset instructions operating elements for the output relay y s m, auxiliary relays and relay. RST command called reset instructions. Its function is to reset the coils. In Figure 1, when the movable contact X1 closed, RST instruction is executed, Y0 reset coils. After first X1, Y0 coils remain a disconnected state. Reset instructions operating elements for the output relays, auxiliary relays y m t, s, integrating state relay timer, counter, c. It is also zero out the word element d, v, z. This entry was posted in plc program and tagged PLC programming, plc training on June 11, 2016 by arco. 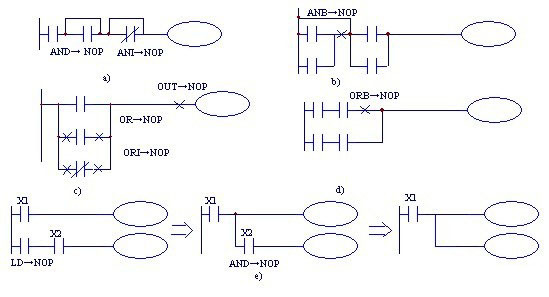 NOP instruction is typically used for the following aspects: Specifies a certain sequence content is empty, blank for use; some short circuit the contacts or circuit, as shown in Figure 7.24 (a), (b) shown cut off some of the circuit, as shown in Figure 7.24 (c), (d) shown in transform previous circuit, as shown in Figure 7.24 (e) as shown. You what kind of touch screen and PLC, because each brand of touch screen and PLC connector wiring and communication methods are not the same, you get their wiring diagrams and PLC downloading programs, touch–screen computers configured, when creating a new project, will let you choose what to connect plc, what type, and then select Configure. Last connection plc and touch screen on the phone. This entry was posted in plc program and tagged plc basics, plc courses, PLC ladder, PLC ladder diagram, plc programming examples, plc programming tutorial, plc training, plc training courses, plc tutorial on June 4, 2016 by arco. PLC is always in order from top to bottom in order to scan the user program (ladder diagram). This entry was posted in plc program and tagged plc basics, plc courses, plc training, plc tutorial on June 4, 2016 by arco. After allowance, as input and output point estimates. Actual orders, according to manufacturer product features of the PLC, the input and output points are rounded. Memory capacity is a programmable logic controller itself can provide hardware storage unit size, program capacity is user applications use memory cells in the memory size of the program capacity is less than the memory capacity. Design phase, because the user application has not prepared, therefore, program capacity is unknown at design time, in the program only after know. Design and selection in order to be able to program capacities have certain estimates, estimation of storage capacity is usually used instead. Estimation of storage capacity memory has no fixed formula, many different formulae are given in the literature, in general are 10~15 times its digital I/O, plus 100 times times its analog I/O, memory–this number is the total number of words (16-bit word), and then press the 25% taking into account the number of allowances. The selection includes arithmetic, control function, communication function, functional programming, Diagnostics and selection of processing speed and other characteristics. Simple PLC functions including operations, timing and counting functions; General PLC operation features include data transfer, arithmetic functions, such as; more complex arithmetic algebra, data transfer and other large PLC also have analog PID arithmetic and other advanced functions. With the advent of open systems, currently already has in the PLC communication function, some products have a communication with the slave, and some products have the same bit machine or PC communication, some products also have the factory or enterprise networks for data communications features. Selection from the actual application requirements, selecting the required functions. The majority of applications, just logic and timing function, some applications require data transfer and, when used for analog measurement and control, using algebra, numerical, and PID operation. To display data for decoding and encoding operations. 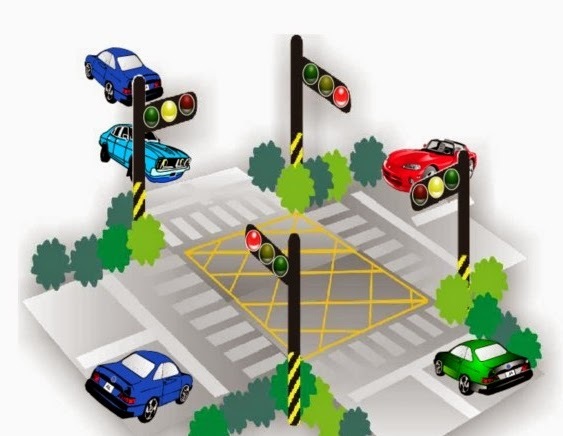 Control functions including PID control arithmetic calculation, ratio control, feedforward compensation control operation should be determined according to the requirements. Main sequence logic control PLC, therefore, the most often used single–loop control of multi–loop controller analogue or, sometimes using special smart input and output units to complete the necessary control functions, improve the processing speed and storage capacity savings of PLC. Such as PID control unit, high-speed counters, analog with speed compensation unit, ASC code–switching unit and so on. Large and medium PLC systems should support a variety of fieldbus and standard communication protocols (such as TCP/IP), needs to be with the plant management network (TCP/IP) connection. Communication protocols shall conform to ISO/IEEE standards, should be an open communications network. PLC communication interface of the system should include both serial and parallel communication interface (RS2232C/422A/423/485), RIO, such as communications, industrial Ethernet, commonly used DCS interface; large and medium PLC communication bus (including interface devices and cables) should be 1:1 redundant configuration, communication should be consistent with international standards, communication distance should meet the equipment requirements. PLC system of communication network, higher rate should be greater than 1Mbps of network traffic, load is less than 60%. PLC system of communications network main form has following several form: 1) PC mainly station, more Taiwan with model PLC for from station, composition simple PLC network; 2) 1 Taiwan PLC mainly station, other with model PLC for from station, constitute master-slave type PLC network; 3) PLC network through specific network interface connection to large DCS in the as DCS of child network; 4) dedicated PLC network (the manufacturers of dedicated PLC communications network). To reduce CPU communication tasks, according to the network‘s practical needs, should have different communication features (such as point-to-point, fieldbus and industrial Ethernet) communications processors. Off-line programming mode: PLC programmer and the public a CPU, programming in programming mode, the CPU only provides services for programmers, not to control the equipment. Upon completion of programming, the programmer switches to run mode, CPU to control the equipment cannot be programmed. Off-line programming system costs can be reduced, but not convenient for using, and debugging. Programming: CPU and programmer has its own CPU, the host CPU is responsible for control and data exchange with the programmer within one scan cycle, programming the program online or send data to the host, the next scanning period, received by the host under the new program. This way costs more, but system debugging and easy, often used in large and medium PLC. Five kinds of standardizing programming language: sequential function chart (SFC), ladder diagram (LD), function block diagram (FBD) three kinds of graphic language and statement form (IL), structured text (ST) in both languages. Select the programming language should follow the standard (IEC6113123), and also supports a variety of programming languages, such as C,Basic, to meet the control requirements for special applications. PLC Diagnostics, including hardware and Software Diagnostics. Hardware diagnostic hardware logic to determine fault location hardware, Software Diagnostics diagnosis and diagnosis. Through software PLC diagnosis is within the internal performance and functionality, software for PLC CPU with external input/output components such as information exchange functions of diagnostics are diagnostic. The strength of the PLC Diagnostics, directly affecting the technical requirements for operations and maintenance personnel, and mean time to repair. PLC scanning mode. From the real-time view, processing speed, the sooner the better, if the signal duration is less than the scan time, the PLC will not scan the signals, causing loss of signal data. Speed of processing and the user program length, CPU processing speed, software quality, and so on. At present, fast response, high speed PLC contact, about 0.2~0.4Ls per binary instruction execution time, so they can control requirements, will require the fastest-growing application needs. Scan cycle (scan processor cycles) should meet: scan time is less than 0.5ms/K for small PLC; large and medium PLC scan time is less than 0.2ms/K. PLC overall type and module type structure is divided into two categories, according to the application environment is divided into two types of installation and control installation; according to the CPU word size is divided into 1-bit, 4-bit, 8-bit, 16-bit, 32-bit, 64-bit, etc. From the application point of view, usually according to control feature selection or input/output points. Overall PLC I/O points fixed, so user a choice small, small control systems; modular PLC offers a variety of I/O card or cards, so users can be more rational selection and configuration control system I/O points, feature extension is convenient and flexible, generally used for large and medium control systems. Input/output module options should be considered and its application requires unity. Input module for example, consider the signal level, signal transmission distance, signal isolators, signal power supply applications. The output module, should be given to selection of type of output modules, relay output modules with low prices, usually using voltage range, longer life expectancy, response time, etc; TRIAC output module applies to switch frequently, low power factor inductive loads, but is more expensive, less able to overload. Output module with DC output, communication output, and analog output, and so on, should be consistent with the application requirements. Depending on the application requirements, selection of intelligent input/output modules, in order to improve control and reduce costs. Considering the need for expanding the rack or remote I/O racks and so on. PLC power supply, in addition to the introduction of devices at the same time as the introduction of PLC according to the product specification design and the outer, PLC power supply should be designed to use 220VAC power supply, consistent with the domestic network voltage. Important applications should use an uninterruptible power supply or voltage regulator power supply. If the PLC with its own power supply can be used, you should check for current meets the application requirements, you should design an external power supply. To prevent external high-voltage power supply by mistake and the introduction of PLC, isolation of the input and output signals are necessary, sometimes it can be a simple diode and fuse tube isolation. 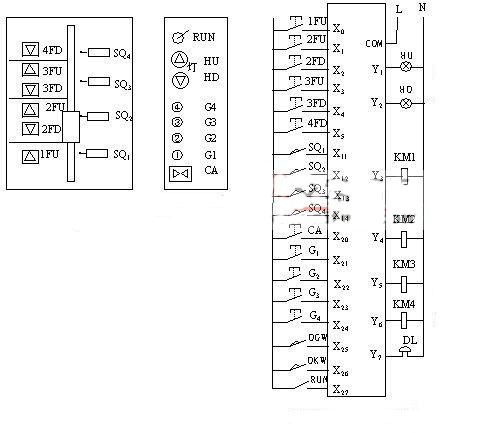 Due to the development of computer chips, memory prices have fallen, so, in order to ensure the normal operation of the project, the General requirements of PLC memory, 256 I/O points at least 8K memory options. When you need complex control functions, should choose the larger capacity, higher grade storage. (1) one of the most important: CPU (including memory) and the power supply should 1B1 redundancy. (2) when needed can also select the PLC hardware and spare software hot standby redundant systems, 2 or 3 of redundant and fault-tolerant systems. (1) control circuit the multi I/O card should be redundant. (2) is an important point of multi I/O card can be redundant. 3) important I/O signals as needed, you can choose 2 or 3 of the I/O interface unit. When you select the PLC, should consider the price–performance ratio. When considering the economy, should be applied taking into consideration scalability, operation, input-output ratio and other factors, compare and balance end up satisfied products. (1) front circuit in series with the parallel circuit blocks and ANB instructions. Parallel circuit block starting with the LD or LDI instruction. 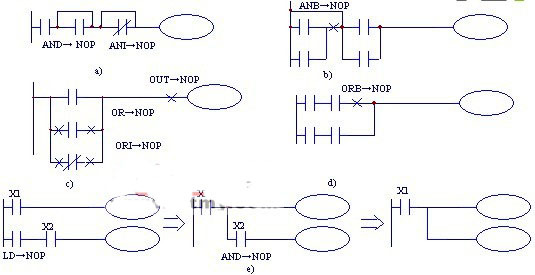 (2) If multiple parallel circuit blocks in sequence with ANB instructions front circuits connected in series, with no limit to the number of the ANB. (3) the ANB directives can be used continuously, but like ORB directive limited to use below the 8. This entry was posted in plc program and tagged plc basics, plc training on June 4, 2016 by arco. (1) the LD contacts compare this kind of instruction mnemonics, code, and functionality. OR= instructions for use as shown in Figure 3-93, when X1 is ON, or the current value of the counter is 200, driving Y0. Contact compare any data format of the source operand. 16-bit arithmetic step 5 program, 32-bit arithmetic 9 programs.